The Lord-Lieutenant is HM The Queen’s personal representative in the county, and is appointed by The Queen on the advice of the Prime Minister of the day. The appointment ends on his/her 75th Birthday. There is an establishment of up to 70 Deputy Lieutenants in Kent who are able to represent The Lord-Lieutenant as required, and assist in the work of the Lieutenancy, including liaison with the 14 Local Authorities. The Lieutenancy plays no part in politics. The Lord-Lieutenant presents medals on the Monarch’s behalf when directed to do so. The Kent Lieutenancy supports the Queen’s Awards for Voluntary Service across the County and The Lord-Lieutenant presents the Queen’s Award for Enterprise and Exports, organised by the Department for Business, Energy & Industrial Strategy, on The Queen’s behalf. To support The Monarch in celebrating Kent, its unique history and culture, serve its communities – and contribute positively to its future. Lord-Lieutenants are appointed by the Sovereign on the recommendation of the Prime Minister. The Lord-Lieutenant represents the Sovereign in the ancient and ceremonial County of Kent, which includes the Kent County Council and Medway Council administrative areas. The duties include looking after members of the Royal Family and Heads of State when they pay official visits to the County of Kent. The Lord-Lieutenant chairs the County’s Advisory Committee on Justices of the Peace and their appointment – and there are more than 900 JPs in Kent. Lieutenancy duties also include presenting honours on behalf of the Crown, and involvement in the honours system. 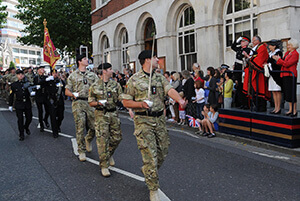 The Lieutenancy maintains close relationships with the Armed Forces, reflecting the ancient office’s original responsibility for the maintenance of order and local defence of the County. The Lord-Lieutenant leads the 70 or so influential Deputy Lieutenants County-wide and is increasingly providing the organisation for their individual networks to interlock for the benefit of Kent’s varied communities. The role of the Lieutenancy is entirely non-political. The appointment carries no pay. Lord-Lieutenants do not normally retire until they are 75. The Lieutenancy maintains close relationships with the Armed Forces. Looking after members of the Royal Family and Heads of State.